Default Rate: Is it a good measure? I have been using default rate (= Number of loans defaulted or charged off / Total loans issued) since I started analyzing historical loan data from Lending Club. While I continue to use default rate, I am not convinced that default rate is really good measure of risk for loans on P2P platforms. I believe default rate is under-representing the risk of such loans primarily due to high growth in issued loans volume in recent years. Higher number of such recent loans with current and issued status in the denominator of default rate calculation may be artificially lowering the default rate. In my last post Lending Club Loans: Loan Purpose and Defaults, I tried to look at data by calculating default rate that excluded loans with current and issued status. This was my attempt to compensate for the influence of recent loan volume. I don't have much knowledge and experience of consumer lending and finance segment. Recently, I have been reading quite a few books, listed in my Reading List, on Risk Management, Quantitative Finance and Fixed Income Investment. Unfortunately, most of them cover corporate loans and government bonds and ignore consumer financing. I would love to learn from risk management people working in consumer lending segment on how they calculate risk with consumer loans. Recently, I came across consumer finance and lending publications from National Bureau of Economic Research (NBER) that seem promising and hopefully will provide me guidance on better methodologies for analyzing data for patterns and influences of different parameters. 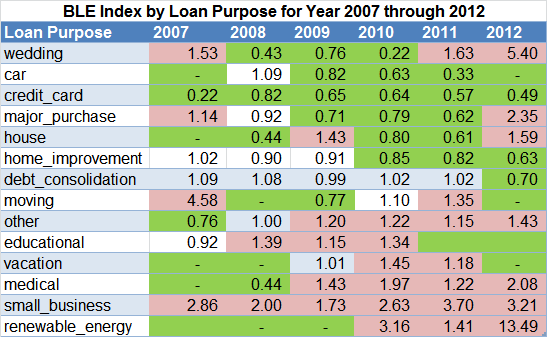 I decided to use one such measure from NBER publication [PDF], "Bad-Loan Experience Index" for analyzing Loan Purpose further. This analysis is also a good trial for me to consider including such measures on PeerCube for historical loan data analysis. I have database portions for historical loan data taken care of at PeerCube. I just need to figure out how we should be optimally using historical information for making loan selection decisions. Your input is most welcome. The Bad-Loan Experience (BLE) Index is the ratio of percentage of bad loans to that of good loans for various options, for example debt consolidation, credit card, car, etc. in each parameter, for example Loan Purpose. This index for all options combined will be 1.00. A ratio greater than 1.00 will indicate worse than average risk. A ratio less than 1.00 will indicate better than average risk. The good loans are defined as the loans that were paid by borrowers without much effort. In Lending Club case, we can consider loan with loan status of Fully Paid as good loans. The bad loans are defined as the loans that were not paid by borrowers. In Lending Club case, we can consider loan with loan status of Default and Charged Off as bad loans. 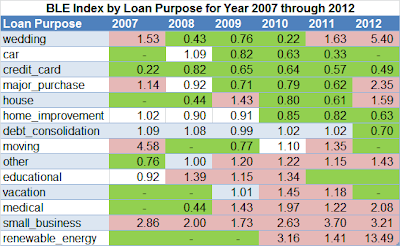 The Table below shows the calculated BLE Index for various Loan Purposes sorted from low to high BLE Index. The green color represent loan purposes that are less than 0.90 and pink color represent loan purposes that are more than 1.10. The variation from loan for car (0.57) to loan for small business (2.34) is considerable. It appears that loan purpose is significantly related to credit risk. Though we need to be aware of the fact that the loan purpose is reported by borrower and there is no secondary method to check intended use with actual use of the loan. Also, borrower may have multiple intended use of the loan. From this analysis, it appears loans for car, credit card, major purchase, wedding, house and home improvement may be better than loans for small business, renewable energy, medical, other and vacation. These findings are not that different from the takeaways in my last post Lending Club Loans: Loan Purpose and Defaults, only exception being house. What I found interesting was that how similar the findings from Lending Club data were to the findings from 1940 study in NBER publication for common categories, specifically for car, medical and business. 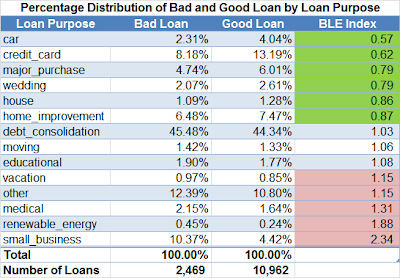 I decided to see if there is any variation in BLE Index by loan issued date. The table below shows the BLE Index for each year from 2007 to 2012. The rows are sorted by BLE Index for 2010. The green color represent loan purposes that are less than 0.90 and pink color represent loan purposes that are more than 1.10. The loans for credit card, car, and home improvement appears to be consistently better than loans for other, education, vacation, medical, and small business, rest being mixed bag. Despite the borrower reported nature of loan purpose, it appears to be significantly related to credit risk. To reduce credit risk, lenders may consider excluding loans for small business, medical, vacation, education, and other purposes.